All offices regardless of the company’s status have a lot of similar things. For example, computers. Every organization requires personal computers for various tasks: create and print documents, make reports, waybills, invoices, etc. Of course, the list of tasks which can be completed using the personal computer is much longer. In most cases, a fully functional and powerful equipment is the key to success. Moreover, the software or apps running on the hardware are even more important, as they truly define the quality of your work. It is very often necessary to connect many devices in a network, so the working data is shared with your colleagues on multiple devices. The data can be copied between devices manually using USB-sticks, external hard drives, or even using a file server. However, this manual work is tedious and error prone in a dynamic corporate environment. Would not it be wiser to use software which is able to keep all devices in the network or even mobile devices up to date automatically? SYNCING.NET programs and apps for desktop computers and mobile devices make this possible and can significantly simplify your daily’s work. SYNCING.NET offers different Outlook synchronization and p2p file sharing software for desktop computers and mobile devices. For more than a decade we develop high quality synchronization and backup software for business and private customers. 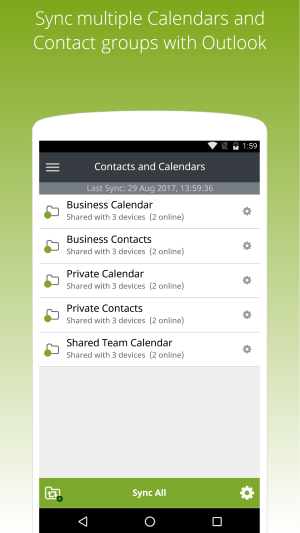 One of our products - SYNCING.NET Business Edition for Android – a sync app for Android smartphone and tablets can be used to share documents, contacts and calendars with other mobile devices or with desktop computers with Outlook. 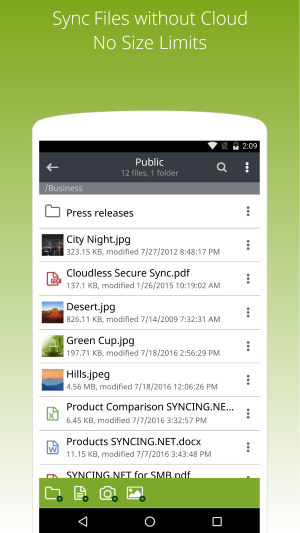 SYNCING.NET is well known as a perfect p2p file sharing app for Android. Don’t hesitate to install the app from the Play Store. Our support team can help you with all possible questions. So, why do you need a software to sync your smartphone with a desktop computer? Any office employee can easily understand it. Such a program can be extremely useful for accountants, clerks, or other persons who work with a large number of documents. This is why. The financial sector is very specific. All financial employees always have a lack of time. Due to a huge number of financial documents, most of the time they have to spend at the office in front of their PCs in order to complete their tasks. Sometimes even this is not enough and they have to take some documents and to work with them at home. Even if they work only with electronic documents, it can be very tedious to copy files to the home PC using portable media like USB-sticks or external hard drives. After processing the documents must be copied back to the office computer. Moreover, the manually copied files on portable media can be corrupted during transportation. As a result, the process of the manual document sharing is very inefficient and takes a lot of precious time. SYNCING.NET offers quality solutions for data synchronization which can tremendously simplify your work and save time. SYNCING.NET is a unique solution for cross-platform data sharing. The data transfer works automatically without the use of cloud services. Your data is stored locally on each device and available even when you have no Internet connection. SYNCING.NET is extremely safe due to the multi-level encryption what can be important for employees working with confidential information. For example, you can safely work with your documents at the office. Then at home you can continue working with the documents using your favorite Android smartphone or a laptop. SYNCING.NET keeps your data in sync for you. If you work at the office, you probably use Microsoft Outlook for your email correspondence. Outlook can not only receive and send emails, but also can store your contacts and manage appointments. If you wonder how you can sync Android with Outlook then the answer is clear. The SYNCING.NET Business Edition for Android is an Android sync app which can help you to sync Outlook calendar events with Android smartphones or sync Outlook contacts with Android devices. Very soon you can sync Outlook tasks with Android too. Also, SYNCING.NET manages a highly protected Android file share for your documents where Android file exchange between multiple devices works automatically. Although many sync apps for Android are available on the market, SYNCING.NET is a unique Outlook Android sync app. The synchronization of Outlook contacts with other computers or with your mobile device can be very useful for persons who have a lot of contacts and must always stay online. SYNCING.NET can sync Android contacts with Outlook easily. New contacts can be created and existing contacts can be edited on any device. SYNCING.NET will automatically update them on all other devices for you. SYNCING.NET works with standard apps on your smartphone. For example, you can create or edit appointments in the calendar app on your smartphone and SYNCING.NET will sync them with other mobile devices or desktop computers with Outlook. The synchronization process is highly secured. Your data will be transferred directly between devices and will never be stored on external servers. So, with SYNCING.NET your privacy is guaranteed. SYNCING.NET will use the optimal way to sync your data across devices with the highest possible speed. It can work with other apps on your Android smartphone and can sync app data. SYNCING.NET is your Android sync software at the first place. SYNCING.NET offers apps for different desktop and mobile devices. SYNCING.NET will help you to keep your data in sync on any device. Thus, SYNCING.NET can replace many apps for data synchronization and transfer like iTunes or Samsung KIS. You just need one app - SYNCING.NET. Availability. SYNCING.NET can be used on any desktop computer (Windows, Mac, Linux) or mobile device (iOS, Android, Windows Phone). Functionality. SYNCING.NET uses an advanced peer-to-peer technology with unlimited data traffic. Security. SYNCING.NET does not store your data in the cloud. All your data is stored locally on your devices and belongs only to you. SYNCING.NET Business Edition allows you to sync Outlook data and share documents with diverse desktop and mobile devices. SYNCING.NET does a safe and simple data synchronization and can be the key to your success. SYNCING.NET offers also other apps for different purposes. Customers may use our Outlook Android sync freeware, SYNCING.NET syncs your personal data to your new phone, transfer data to new iPhone or use our Windows phone sync app for free. Please visit our website for more details. You can download the apps for free.